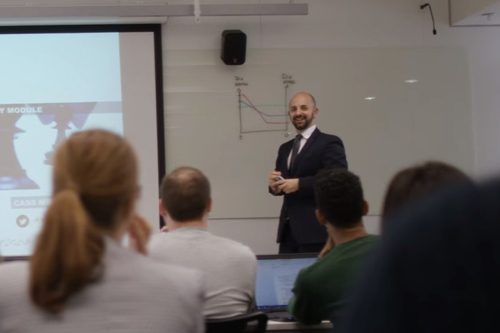 Formula 1 expert teaches strategy at Cass Business School. We are delighted to share that Paolo Aversa has been named as one of Poets&Quants’ Best 40 Under 40 Professors for 2018 after receiving almost 40 votes from students and alumni at Cass. Paolo’s passion for his subject is infectious. His involvement in the MBA extends beyond the classroom – he was always available with words of encouragement and humour. Poets&Quants‘ 2018 class of the 40 Best Business Professors Under 40 looks at the most inspiring young academics at the best business schools in the world. Each year the list illustrates that up-and-coming B-school professors are just as passionate about using business as a force for good as many of their students are, leveraging their work as academics to uncover new knowledge. Bringing energy and focus to his classes, Paolo fosters a classroom that challenges his students and brings out their best. Dr Paolo Aversa is Senior Lecturer (Associate Professor) in Strategy and the Course Director for the Full Time MBA. “I feel honoured and blessed for this achievement and grateful to Cass and City for giving me the opportunity to develop my profile. My biggest thank goes to my students, alumni and colleagues who have generously endorsed me for this award. As business academics our job is hugely critical for society, as it shapes tomorrow’s leaders. I hope to be able to become a better academic and learn from some of outstanding senior colleagues here at Cass." You can read Paolo's full interview on Poets&Quants.